for victims of the November 2018 Camp Fire. If California's electric utilities, energy regulators, firefighters and the communities they serve are to win the state's unprecedented war against wildfires, ignited by the combustible combination of utility infrastructure and climate change, they are going to need some new weapons. Technology giants International Business Machines Corp., Google LLC, Hitachi Ltd., Microsoft Corp., Oracle Corp. and Siemens AG are among a growing collection of companies large and small that are driving the development of artificial intelligence and big-data analytics to defend the state from infernos sparked amid increasingly hazardous climate conditions. "Only through machine learning and data science can we actually achieve what we have not today, which is preventing wildfires," Jeff Pauska, a senior manager at Hitachi's global consulting subsidiary, said March 20 at California's inaugural Wildfire Technology Innovation Summit in Sacramento. "Think about one notion: deep learning to prevent every single utility-involved wildfire," Pauska said during a presentation of a platform that "gets smarter over time" as it receives more utility, weather and wildfire data. California's big three investor-owned utilities are already sold on AI, though they are just beginning to tap its potential to prevent and limit the growth of wildfires. Pacific Gas and Electric Co., or PG&E, views AI as a key building block in its bid to refortify its far-flung service territory against the kind of blazes that devastated northern California in 2017 and 2018, according to Sumeet Singh, vice president of PG&E's wildfire community safety program. In January, PG&E entered into Chapter 11 bankruptcy protection with parent company PG&E Corp. related to billions of dollars of liabilities linked to its power lines. "It is no longer, from my perspective, nice to have for a utility operator. It's a must-have. We need the capability, we need the [empowerment] of this technology," Singh said March 21 on a panel discussion at the event. PG&E faces a greater threat of wildfires than most, if not all, other electric utilities in the world, given that its roughly 70,000-square-mile service area contains about 70% of California's high-fire-risk terrain. "It is our unwavering goal to prevent ignitions to protect our customers and communities," Singh said in an interview on the sidelines of the event. In 2019, PG&E has been building out a new "holistic approach" for transmission tower inspections that relies on drones to collect images and AI to process the massive data haul. So far, the collection includes 1 billion-plus data points, more than 10 terabytes worth. "Drones are on the front end ... and the back end is really where machine learning comes into play," the PG&E executive said. "With machine learning, it's all about feeding it with images of what is in good condition, what is bad and what is poor." Working with a data specialist, the utility then creates an algorithm that calculates where it should focus resources and money to reduce the greatest risks of wildfire on its system. The utility plans to further develop such capabilities through its proposed $1.7 billion to $2.3 billion wildfire mitigation plan, filed in February, and its 2020 general rate case that includes a request for a nearly $1 billion boost in electric generation and distribution base rates. 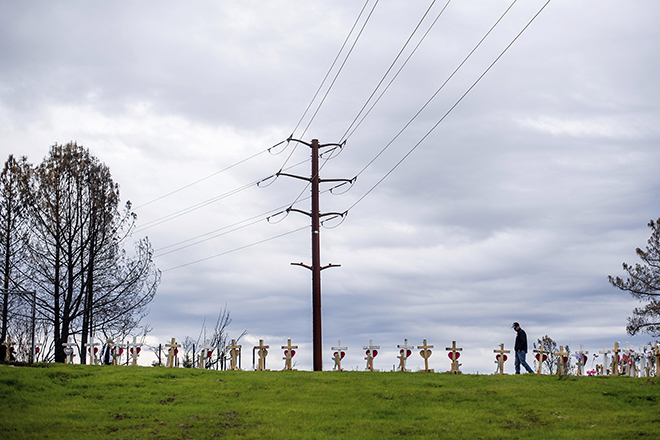 Sempra Energy's San Diego Gas & Electric Co., which developed the nation's largest network of utility weather stations and its own meteorology team in the wake of devastating 2007 wildfires, sees AI as part of its next front, Caroline Winn, the utility's COO, said in Sacramento. The utility plans to feed its AI with "tens of millions of data points" produced by its weather stations and vegetation management activities "to accelerate our system hardening in high-fire-risk areas," Winn said. "We are not resting on our laurels." 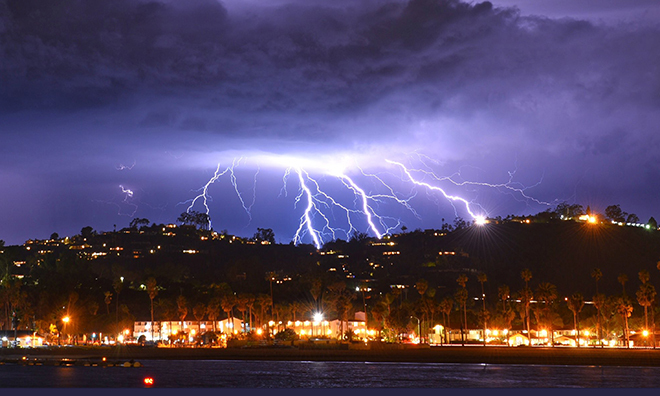 Edison International utility Southern California Edison Co. has also begun using AI as part of a project to parlay smart meter data and analytics into detecting live wires downed by lightning strikes, another leading cause of wildfires. "We want to have faster, quicker, better data so we can send our troubleshooters out to wires down," Jim Cherrie, director of the utility's grid operations, said in a presentation. "We are in the early stages of using AI for what we want to achieve today." Regulators tasked with approving AI-based investments as new weapons in the state's arsenal against infernos may still need some convincing. "The processes that the law requires us to carry out are actually designed to prevent new technology until we've exhausted the lifespan of the technology we have already invested in," California Public Utilities Commission President Michael Picker said at the event's closing session. "Therefore, our job is to kill innovation ... You have to give us the tools to make good decisions."